The expression "fighting like cats and dogs" is fairly common because most cats and dogs don't actually seem to like each other very much, but these examples of dog and cat love will show you there are exceptions. These cats and dogs are besties, and there might even be a hint of romance in the air for a few of them! As if Chloe and Abby weren't cute enough, their snuggling here is set to the most adorable little song. It will make you want to go out and get a Dalmatian and a cat just to see if you can recreate this scene for yourself. This cat knows a comfy sleeping spot when she sees one! These two look so cozy and warm together you'll want to take your own catnap. Or cat-and-dog-nap as the case may be. This is a different kind of dog and cat love, but it will absolutely melt your heart. The dog here, Mary, has seven puppies of her own. When three abandoned kittens were brought into the shelter where Mary is taking care of her pups, they were instantly adopted into the fold. This might be the cutest thing you see all day. Dogs like to lick things, but generally those "things" don't include cats. And generally cats don't have the patience to tolerate such a thorough cleaning from another animal. The dog seems a little protective of the cat as well -- maybe because of the frightening posters and objects on the walls? Take one sleeping dog, add two sleeping kittens plus one who's just getting ready to snuggle in, and you get a lot of cute with a side of smiles. This cozy quartet is all ready to have the sweetest of dreams. This brave cat likes to knead on the back of his buddy, a Rottweiler. The dog clearly enjoys it too! Admittedly, this video is a little long, but the catchy theme from Toy Story in the background is worth the extra time. A gorgeous Bengal cat and a sleek Doberman, obviously the best of friends. Perhaps they were united over the fact that they're forced to spend their days on an ugly purple sofa. Percy is an adorable rescue dog, and George is a feral cat. When Percy goes outside George joins him and follows him around. They really seem to like each other's company! Dobermans sometimes have a reputation for being scary, but not this one. Here he's sharing not only his space but also a toy with his friend Pancake the cat. It's adorably cute to watch how well they get along together! Also, how cute is the name "Pancake" for that particular kitty? Friends come in all kinds of different shapes and sizes, and sometimes even species! 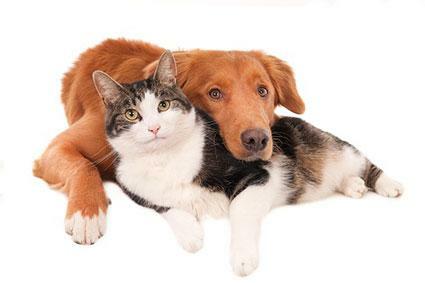 These cats and dogs, who obviously love one another, are good examples of how opposites can often attract.